Whether you’re a casual coffee sipper or a forever-latte lover, Seattle is most known for their coffee, and with good reason. The warm elixir is a weapon against Seattle’s gloomy skies and damp sidewalks–it’s easy to stay warm with a latte in hand. I’m known amongst my friends as being a bit of a “coffee snob” who always knows the best spots—especially the ones that look great on Instagram. I have a thing for simple menus, brewing to order, cold brew on tap (with or without nitro), decorative latte art, and single-origin coffee. I’ve been copy and pasting an exclusive Notepad list to friends and tourists for years, and now I’m sharing them with YOU! The coffee giant needs no introduction and obviously knows their way around coffee, so it’s no surprise they’ve created what I consider to be “the Disneyland of coffee.” The Starbucks Reserve Roastery is where they roast their small-batch Reserve roast, but is also where they test new products and create a coffee “experience” unlike anything I’ve ever experienced before—you’ll be entertained by the sights, sounds and smells of coffee roasting but you’ll also be able to experience new coffee-inspired beverages that they don’t serve in normal Starbucks stores; cold brew mocktails made like craft cocktails and affogatos (that’s ice cream with an espresso shot). Skip the tourist-infested Pike Place “world’s first Starbucks” and make the trek up Pike Street to the Roastery. You’ll thank me, I promise. Located in the same building as Starbucks Head Office, the Starbucks Reserve Sodo features a Princi bakery and a full bar (happy hour at SBUX, anyone?). The menu at this Starbucks is completely different than the one you’ll see at retail cafes. Walk up to the coffee bar, order your drink, and pull up a chair to stay for a while. Make sure to try the House Affogato, if you’re into that kind of thing. The food at this Starbucks is next level. Princi, a bakery from Italy that Starbucks decided to swallow up, serves incredible flat bread pizzas and treats. I love stopping here for lunch on my way home from downtown meetings. Besides being adorable, the coffee is damn good, too. If you’re looking for a smooth cup of coffee or a perfectly poured latte (with latte art! )—this is a good place for you. Olympia Coffee Roasters has been roasting small batch and single origin coffee in Olympia since 2005. The West Seattle location is their first location outside of the south Sound. Their award-winning coffee beans come from working and trading directly with coffee farmers in Africa and Latin America. Milstead & Co. serves my favorite vanilla latte in all of Seattle. As a purveyor small batch coffee beans from a variety of nationally-renowned roasters (grab beans from roasters like Bows & Arrows, Intelligentsia, or Heart Coffee), the under-the-bridge Fremont coffee shop also pulls a great espresso shot. The Pacific Northwest was birthplace of people asking “who’s your roaster?” so it’s no surprise that Seattle has a reputation for being slightly snobby about their coffee, which usually means their baristas are pretentious and might scoff at you if you ask for a Soy Latte, but Milstead is different. The baristas here have a tendency to make you feel like you’re an old friend (a quality I adore), and are extremely passionate about espresso. I’ve also enjoyed their quirky taste in music; often jamming to mid-90s hits or pop-punk while pulling shots. In addition to their coffee, they also have a variety of non-coffee beverages like a Golden Milk latte and a Burnt Sugar lemonade that’s to die for, srsly. Without Espresso Vivace, millions of Instagram accounts wouldn’t exist. This Italian-style coffee shop is credited as the coffee shop that brought latte art in the U.S. Just let that sink in for a minute. David Schomer, co-proprietor of Espresso Vivace, was inspired after a trip to Milan, where baristas poured shapes into milk, and brought it back to Seattle in the 1980s (before Starbucks). The rest is coffee history. With three places to enjoy their lattes in the Seattle area, you have plenty of opportunities to sip latte history. You might recognize this name because their espresso machines are in literally every single coffee shop ever. Of course the most popular espresso machine manufacturer has a headquarters in the city known for coffee. This cafe is housed inside the same building as Seattle’s popular independent radio station, KEXP and has a showcase of La Marzocco’s espresso machines to lust over while you wait for your coffee to brew. 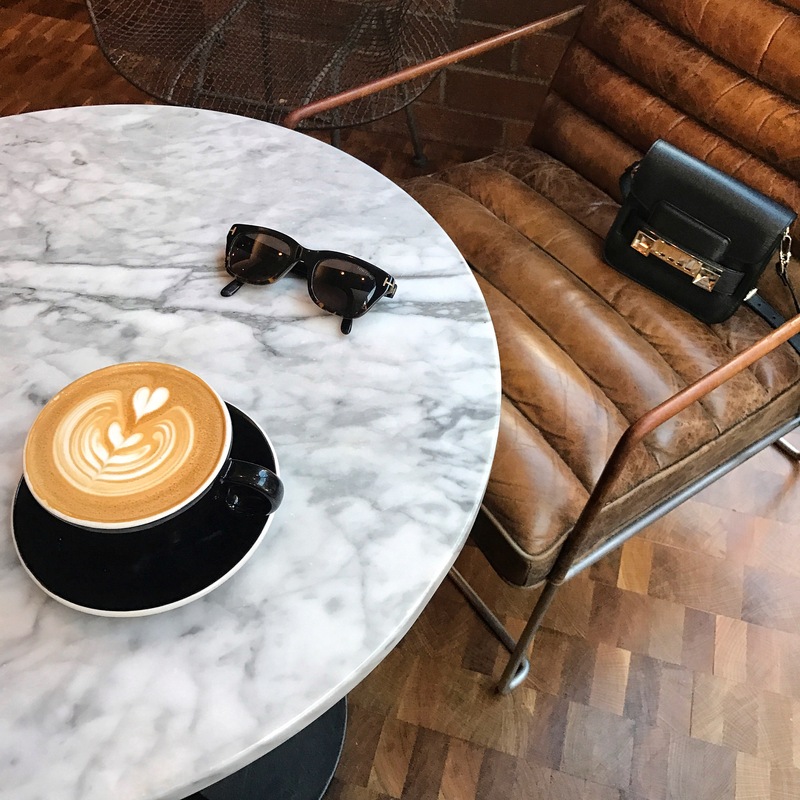 This cafe, unlike others in Seattle, features a different coffee roaster every month so you’ll always try something new when returning to this chic spot in the heart of Seattle center. Even better, if you’re visiting from out of town, this coffee shop is around the corner from the Space Needle. If you’re in the Pioneer Square area, this is a must-visit. Their in-house small-batch coffee beans are roasted in the back of the cafe, which creates an intoxicating aroma to entice you to take a seat at their white marble bar. Stop in for latte, savor pastries from the incredible local bakery London Plane, and enjoy the buzz of local entrepreneurs working at small tables. What do you know about deconstructed lattes? This Ballard-based coffee roaster is tucked away in a sleepy neighborhood, but don’t let its quiet demeanor fool you. Inside, enjoy an offering from their simple menu of hand-brewed small-batch coffee, espresso, and espresso + milk. Their deconstructed latte, shown above, allows sippers to enjoy each component of a latte separately (espresso + milk), and then together as a complete latte. Any coffee snob would appreciate this little gem. If you can’t get to their Ballard location, they have four other cafes around Seattle. This Bainbridge island based coffee shop is unlike others on this list because it’s… a bit fancy. Though they have a few locations in the downtown area, the Pike Place Market cafe is by far the one I recommend because of its luxurious ambiance. Nestled upstairs in one of the old buildings at Pike Place, this cafe has large arched windows that bring in natural light and breathe out an unmistakeable view of the Puget Sound. Their specialty coffee beans are heavy on the nut/chocolate undertones, which makes them perfect for a latte. This newcomer is quickly gaining attention (i.e. Instagram posts) for its clean, airy, modern design and delicious coffee. This quiet coffee shop in the Central District has a small mezzanine for working or enjoying your latte while you lurk cafe goers. Music from a turntable creates a vintage-inspired atmosphere that any Seattlelite would return to again and again. Bonus: there are a few cannabis stores around the corner–perfect for tourists wanting to enjoy legal marijuana. This Portland-based coffee shop is every Seattle resident’s favorite coffee shop to hate (besides Starbucks, obv). Now owned by the other coffee giant, Peet’s Coffee, this coffee shop was one of the first third-wave coffee shops in the United States. They’re known for their direct-trade coffee beans and cold brew coffee but these cafes also make a mean nitro cold brew if you’re not into it hot. 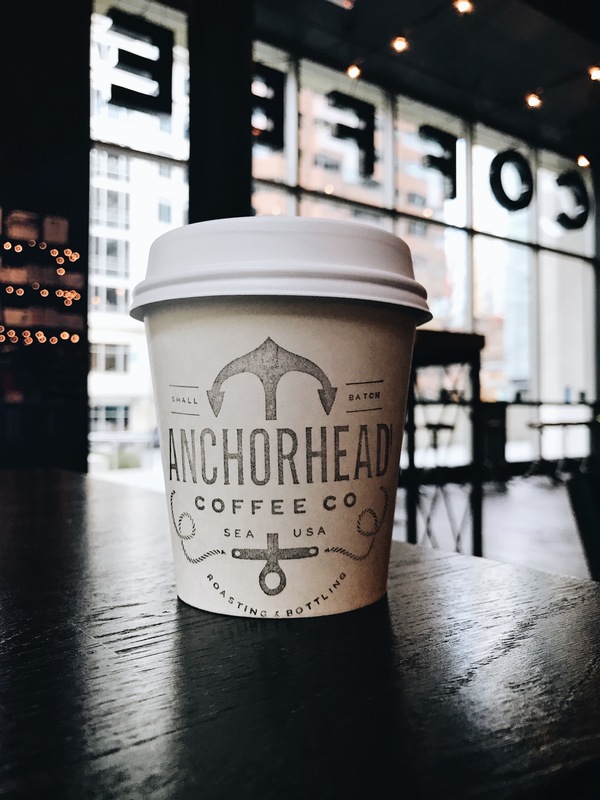 Known for their cold brew coffee bottles in grocery stores around the Pacific Northwest, Anchorhead coffee opened their downtown Seattle coffeeshop that serves as a perfect midday stop in the bustle of the city. The cafe ambiance is dark and cozy, despite its floor-to-ceiling windows decorated with ultra-large “COFFEE” typography, as if to taunt passerbyers for their obsession. They also serve a variety of coffee, tea and beer/wine at this hidden gem tucked into the base of an office building. This cafe in the heart of downtown is one of my new favorite spots for a coffee, bite to eat, and of course, instagram photos. This spacious mid-century modern cafe also serves (avocado) toast, waffles, and the best damn cream-filled donut in Seattle. Step into this cafe and you’ll feel instantly transformed into a much more awesome version of yourself with its minimal white-and-wood ambiance and chill vibes. It’s really hard to narrow down my favorite coffee shops, but these are the places I’d recommend to my best friends and worst enemies, since everyone deserves a good cup of coffee. Now it’s definitely time for a cup or five.